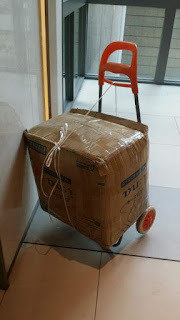 20151118 my 17kg parcel arrived ^_^ Japan Post is so awesome, you book a slot online and they come and pick your parcel up from your home at no extra charge!!! You don’t have to carry your parcels to the post office !!! (How can I carry 17kg to the post office myself?!) Just remember to fill in the FUNABIN 船便 (sea shipment) waybill - ask for one from the post office, it’s not displayed on the desks… instead of the usual waybills. No sweat !!! !